In Table 1, below, we list the all-time record daily maximum temperature observed in each of the 52 entries (as compiled by the SCEC) and the date and location where it was recorded. 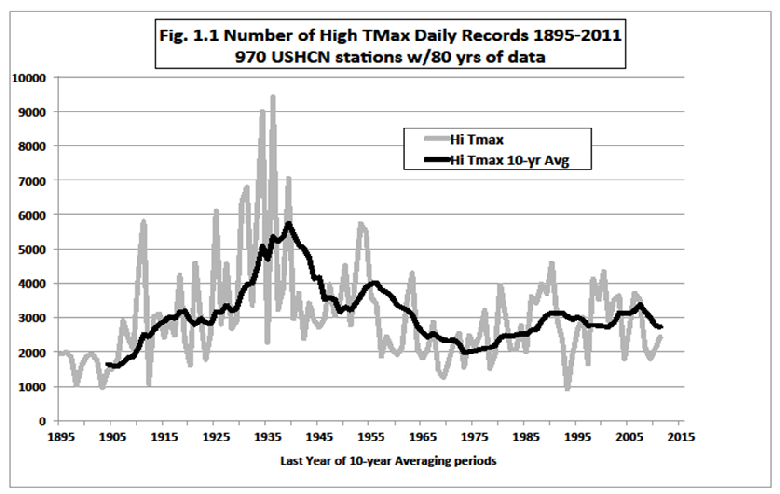 Notice that the vast majority of the all-time records were set more than half a century ago and that there are exceedingly few records set within the past few decades. This is not the picture that you would expect if global warming from greenhouse gas emissions were the dominant forcing of the characteristics of our daily weather. Instead, natural variability is still holding a strong hand. In Table 2, we’ve compiled the top five years when the most records were set. When multiple years tie for the high, each individual year gets a fraction of a “record”. So, for example, 1954 and 1933 each get a half of a record for Colorado.